The Juggernaut, a.k.a. Cain Marko, was a prisoner on The Raft when the Hammer of Kuurth crashed into it. Marko picked it up and was possessed by Kuurth, Breaker of Stone, becoming one of the seven Worthy. 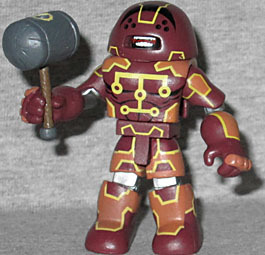 As detailed in our AvX Minimates review, we pointed out that Juggernaut lost his Juggernauty powers because Cyttorak was pissed at him. It wasn't just because he'd been possessed by Kuurth, but because he'd allowed himself to be: using his existing powers, he could have thrown the control off if he wanted to. Kuurth's costume is very similar to Juggernaut, but with a lot more orange panels and yellow outlines (the sure sign of "Asgaardian origins" in Fear Itself). The hands and helmet are new: we can see his teeth through the mouth-hole, but the six eyeholes are just painted on. Kuurth's hammer is a simple drum shape, with a fairly short handle. 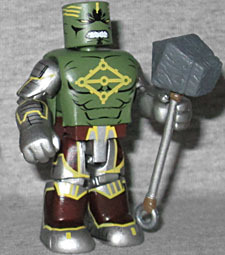 When a strange hammer landed near the Hulk, he picked it up and was transformed into Nul, Breaker of Worlds. As one of the Serpent's Worthy, Nul spread fear until he was knocked into orbit by Thor. Yes, and then he came back down in Transylvania, where he fought Dracula. Nul is wearing a lot more clothes than Hulk usually does - only his chest is bare. He has banded silver arms, and brown sections on his pants that are even darker than Kuurth's. He still gets the glowing yellow lines, though so many of them are on the silver (where they barely contrast at all) that it's easy to not see them. The ones on his chest and running around the sides and back of his head are much more eye-catching. Nul's hammer is more square than Nul's, with a flat face and a tapered point in the back, as well as a long handle that terminates in a metal loop. Marvel Minimates TRU Series 15 is another series where all the figures were exclusives, but only half of them were marked, which is frustrating. On the other hand, all the sets were also intended to complete or complement existing releases, which is fun: in this case, Kuurth and Nul go along with the Fear Itself "Worthy" box set (although even with them, that only brings us up to four out of the seven Worthy, not the full team). This entry was posted in Art Asylum, Marvel, MMMR and tagged Fantastic Four, Hulk, Minimates, Thor, X-Men. Bookmark the permalink.